What do you get if you take the Grand Princess and add another deck? Why, the Crown Princess, of course. As the latest, greatest, and most amenity-packed ships in the Princess fleet, the Crown Princess and her siblings feature everything that makes a Princess ship special. And while not the largest ships in the Princess fleet (that distinction belongs to the Diamond and Sapphire Princess), the Crown and her sisters are the most feature laden. When the Crown Princess hit the scene, it upped the ante on what Princess had to offer. First and foremost was a new feature called the Sanctuary, an adults-only, top-deck hideaway of cabanas, healthy snacks and soothing music. The Sanctuary was an instant hit, and later was rolled out across the fleet and added to ships from sister brand Carnival Cruise Lines as well. Another new feature seen for the first time on the Crown Princess was the Crown Grill, a premium steak-and-seafood restaurant in a rich, woody setting. The Crown Princess also ushered in a new piazza-style atrium that’s sort of like a seagoing street fair, plus a Caribbean café, international café, and a wine-and-seafood bar. Add to that a giant poolside LED screen for “Movies Under the Stars”—and you have 113,000 gross tons of world-class seagoing resort. The Crown Princess has three main dining rooms that come in handy for the line’s Personal Choice Dining Program, which allows passengers to choose from Traditional Dining with early and late seatings for dinner or Anytime Dining. 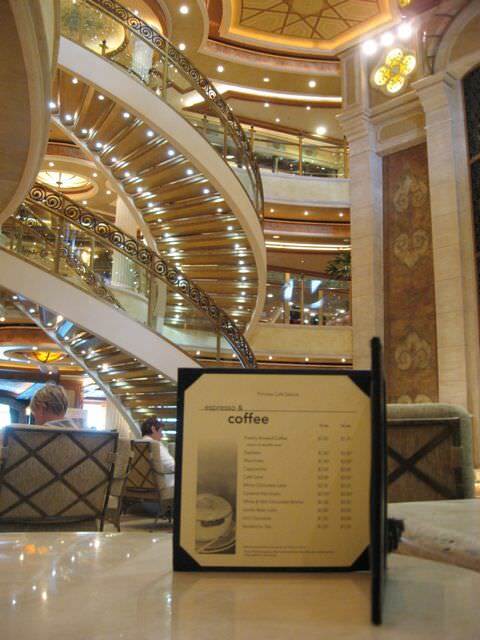 The ship’s 24-hour casual restaurant, the Horizon Court, offers a buffet alternative for breakfast and lunch; at night it becomes a sit-down bistro. Tuscan-inspired Sabatini’s is the ship’s venue for upscale Italian fare, and has established itself over the years as one of cruising’s more popular alternative restaurant concepts. 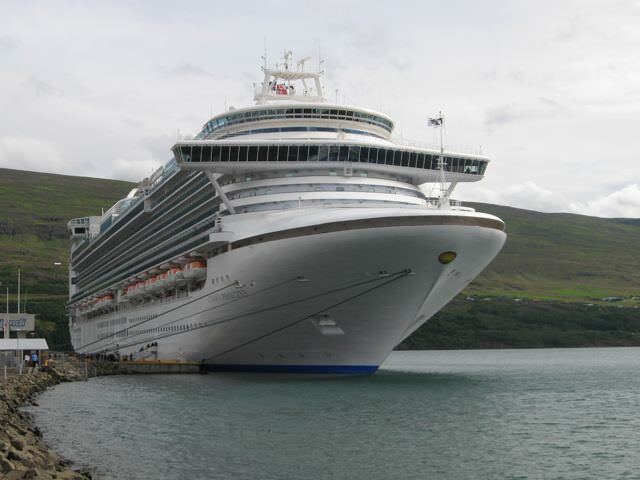 High above the bridge, the Crown Princess has a forward-looking ocean-view spa and fitness center. Further aft, the ship offers two outdoor pool areas: One amidships with a sliding canopy, the other a more secluded spot overlooking the stern. The designers of the Crown Princess wanted private verandahs to be available to virtually everyone, and this ship has nearly 900 cabins with balconies, ranging from standard outside cabins to mini-suites and full suites. An unusual tiered design means the balcony above doesn’t block the sun, but nor does it offer much in the way of privacy. It’s worth noting that except for the handful of mini-suites on Emerald Deck, the majority of staterooms in this category are situated on the completely-uncovered Dolphin Deck. 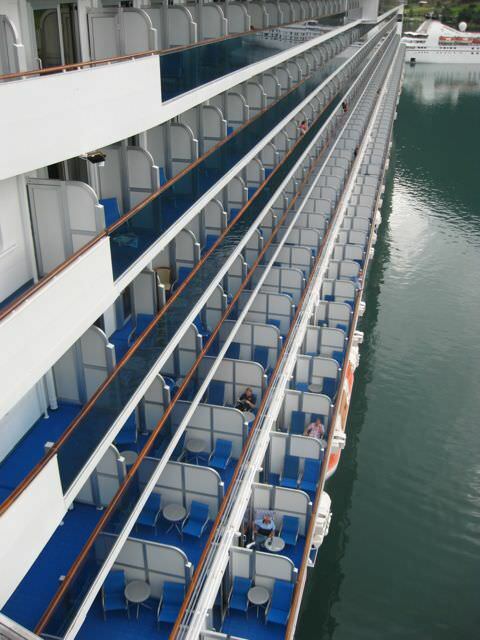 Regular balcony staterooms one deck up on Caribe deck feature balconies that are half covered, half-uncovered. In keeping with the “Big Ship Choice, Small Ship Feel” mantra of Princess Cruises’ ships, there are a number of nooks and crannies for a little peace and quite, including a small library, writing room, and a card room. Kids, on the other hand, will find plenty of spaces just for them.